Arrive early for the 2018 ASCB|EMBO Meeting to attend the 2018 4DN-ASCB Satellite Meeting: Bridging the 4D Genome with Cell Biology from 8 am to 7 pm, on Friday, December 7, at the Marriott Marquis San Diego Hotel and Marina. This conference, jointly organized by the 4D Nucleome (4DN) network and the American Society of Cell Biology (ASCB), will feature recent technological and conceptual advances in research of the higher-order chromatin organization in eukaryotic cells. 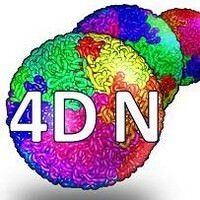 The 4DN network was launched in 2015 as an NIH Common Fund project, and its goal is to develop and apply approaches to map chromatin structure and dynamics to gain a deeper higher-order mechanistic understanding of how the nucleus is functionally organized. The 2018 4DN-ASCB Satellite Meeting aims to highlight rapid progress in the study of genome organization and facilitate the dissemination of new technologies and concepts to the broader cell biology community. The keynote speaker for this meeting is Stefan Mundlos of the Max Planck Institute for Molecular Genetics. For more information and to register, click here. The fee is $70 and includes light refreshments and lunch.